(TB30DP6) GeoCoins.net Trackable Token Geocoin - Todie's Wild Ride II: Don't text and drive! Todie's Wild Ride II: Don't text and drive! In the hands of thefoolandhisqueen. Use TB30DP6 to reference this item. 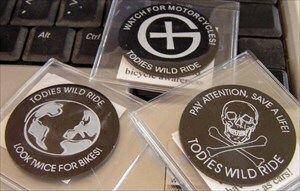 Gallery Images related to Todie's Wild Ride II: Don't text and drive! We're headed to the northeast in a few weeks, this will be going with us to help spread the word. We are helping to get this coin on the road. Lots of people out there need to be reminded of this mission- Travel far and wide!